electro-music.com :: View topic - Octave transvering puzzzzzzle! Posted: Tue Apr 17, 2018 6:29 am Post subject: Octave transvering puzzzzzzle! Not sure what you are looking for. Is it some effect similar to an arpeggio going up and down through the octaves? Then your solution is good. I would just feed the three selects to the highest three outputs of the 4016 so you can hear more than a few cycles of each octave frequency. 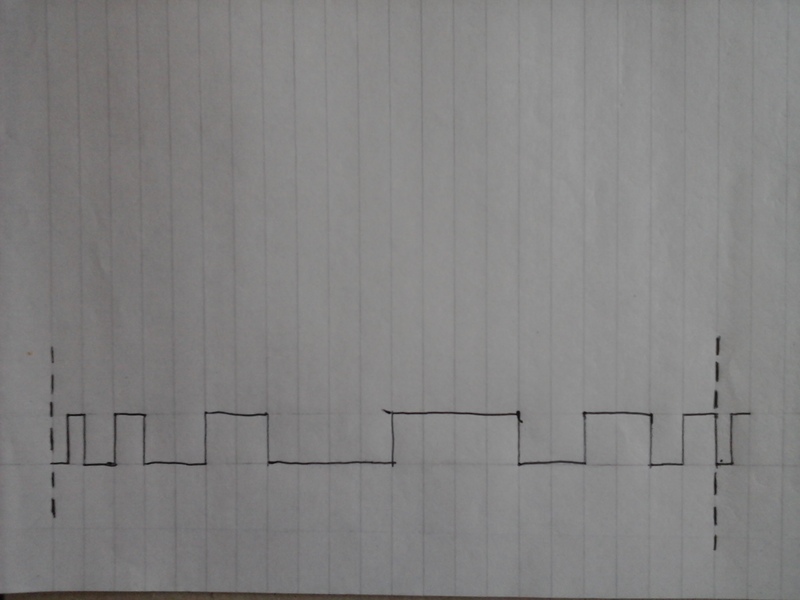 And I think Im kind of after a sort of timbral thingy with it rather than arping. But of course these things are cool and useful to run at audio or event rates! Maybe have a look at rate multipliers like http://www.ti.com/general/docs/lit/getliterature.tsp?genericPartNumber=cd4089b&fileType=pdf or [ http://www.ti.com/product/CD4089B ] for the top level view. Here's something that probably won't completely work, but it's a start. This is what I got, but I cant tell if it works or not! Haven't looked at the output with a scope, but this is how it sounds. Ha! Cool! Is that the circuit I just posted? I guess its easy for my circuit to go out of sync so it outputs something else. Therefore, proding the reset on the 2nd part of the 4520 should put out different pulse patterns. I did a quick simulation with digital works and it works about 50%. I'll have to draw a timing diagram to see what exactly is happening. matter. I think it just changes the phase compared to something else running from the same clock, but the pattern stays the same. Any recommendations for software to generating timing diagrams? I tried doing it on paper but it got confusing pretty quickly! I don't know of any software but I did write down somewhat of a truth table. By the looks of it starts to repeat after a couple of cycles. When I initially tried to solve it I first drew up a timing diagram to see which divisions need to be selected and when. As you can see there is a bit of a problem which is probably releated to why your version doesn't fully work. This is also the reason why I opted for a 4029 to do the up/down counting. I did make a mistake in the circuit diagram: there needs to be an inverter between the carry out of the 4029 and the CLK in of the 4013. Ah nice. Thanks for explaining the way you approached it. Good idea drawing up which divisions are needed etc v smart! That timing diagram is also how I came up with using a priority encoder. fully works or not, I also didn't check yet if it still works correct when counting down. 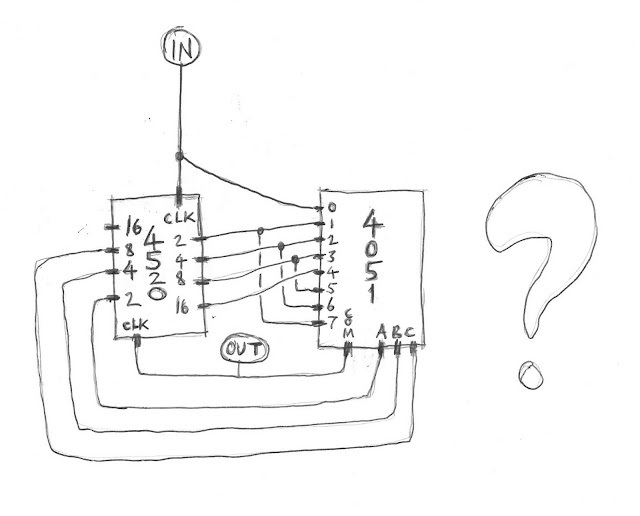 the CBA control inputs of the mux need to be 001.
and that's exactly what the priority encoder does. I think it is also possible to chain 2 4029 counters which would give another 4 bits that can be connected to the priority encoder. 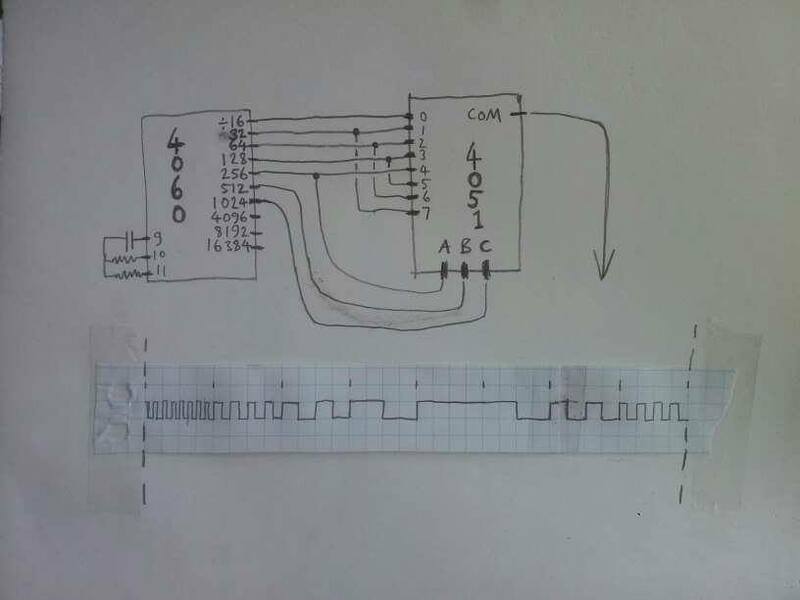 Q2 of the encoder can then be connected to input C of the mux. ace! You are the king of logic!